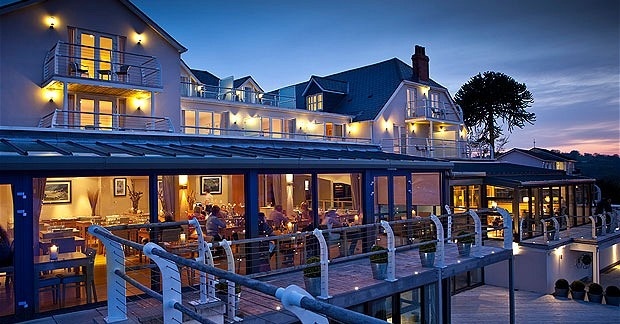 St Brides Spa Hotel is located on a headland overlooking Saundersfoot harbour with spectacular elevated views of Carmarthen Bay. A privately owned hotel which has recently been refurbished to create a contemporary destination spa hotel. Bedrooms are individually styled in a light, airy seaside theme. Each has a big bed, powerful shower and lavish bathroom with bathrobe. The Cliff Restaurant is at the heart of the St Brides. Versatile menus and intense flavours are created with fine Pembrokeshire produce. Fresh, locally landed fish is on the menu every day. The Gallery at St Brides Spa Hotel shows paintings from leading modern artists. The hotel’s Marine Spa includes a steamroom, salt room, rock sauna, adventure shower, ice fountain and a hydro pool which has sea views. Guests can book a complimentary 90 minutes in the Thermal Suite and Hydro Infinity Pool.